Today BBC Studios revealed that 1973's Season 10—home of Doctor Who’s groundbreaking 10th anniversary celebration “The Three Doctors,” uniting Jon Pertwee, William Hartnell, and Patrick Troughton’s Doctors for the very first time — is the latest classic season to be released as part of Doctor Who: The Collection, joining the likes of Tom Baker’s first and last seasons on the show as well as Peter Davison’s debut. 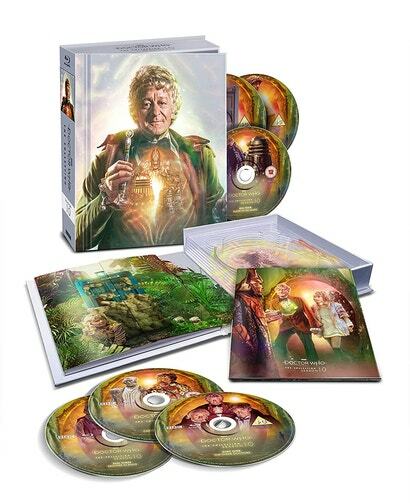 As well as containing all five serials in the season (“The Three Doctors,” “Carnival of Monsters,” “Frontier in Space,” “Planet of the Daleks,” and “The Green Death”) with options for remastered special effects and cleaned-up visuals, the box set includes a host of special features, including both material from each story’s previous release on DVD as well as new content created just for this collection. “The Green Death” was Manning’s final story as Jo, and saw her and the Doctor battle oversized creepy-crawlies in South Wales, after toxic sludge mutated them to monstrous size. Over the course of the story Jo met eco-activist Cliff, and fell in love — hastily announcing not just an engagement, but that she and the Doctor would be parting ways, leading to the heartbreaking moment the Doctor quietly exits Jo and Cliff’s engagement party and drives off into the sunset. But now we know what happened four and a half decades later, as Jo and Cliff apparently ventured back to the Wholeweal “Nuthutch” commune to tackle a few bugs the Doctor had left unsquished. Did we need to? Not really. But it’s delightful to see the BBC have a bit of fun with the announcement anyway. Doctor Who: The Collection—Season 10 is set to release in the UK July 8; it’ll be on our shores as the awkwardly titled Doctor Who: Jon Pertwee — The Complete Season Four October 15.